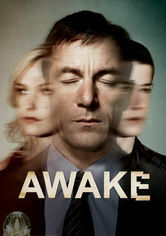 Awake (2012) on Netflix Switzerland. Check worldwide Netflix availability! If Awake isn't available in your country, or you are visiting a country where it isn't, there is still a way to watch it! After surviving a car crash, detective Michael Britten travels between different versions of reality, being forced to grasp two versions of his life. A detective leads a double life: One with his dead wife. One with his living son. Or is it the other way around?